What inspired this world of unique heroes and outsiders? I wrote Hero with the sincere and passionate intention of telling the traditional hero's journey, and turning it on its ear by creating a hero unlike any we've ever seen before. I wanted to write a book that I wish I'd had to read when I was young. So many specific things inspired Hero. Two things come to mind: one, my dad, and two, comic books. I always wanted to find a way to tell the story of my father, a Vietnam veteran, and his son. Like most young people, I grew up feeling alienated and different—for very specific reasons in my case—in a place that didn't value differences. I also have this borderline-crazy belief in the power of literature to change the universe. So I'd always wanted to tell this story. I know my father saw things in Vietnam. We didn't talk about it growing up. No one wanted to discuss Vietnam or what vets went through back then. That's something those men had to carry around forever. I know Dad won a Bronze Star, and they award those for valor in the field, so he definitely saw things. Years later, as I became old enough to understand, he gave me a book to read that he believed captured the experience. He gave me Tim O'Brien's The Things They Carried. I had a meeting with Tim once about a possible movie, and he signed a book for my father. His inscription almost made me cry. It said, "Dear Bill, Peace and welcome home.—Tim." That signed copy meant the world to my father. I wanted to write a book that would mean that much to someone. The story of Hero began to take shape when I married the story of the father and son with the world of superheroes. What better allegory for a Vietnam vet than a disgraced superhero? I have always been enthralled with comic books and superheroes, and I've always believed there should be a gay superhero. Not as a joke, not as a supporting character, not as a victim, not as a token, but as a real front-and-center hero. I've always been surprised by how few gay heroes there are in comic books, and I decided I would write the definitive coming-of-age story of the world's first gay teen superhero. I was very surprised by the low number of gay characters in comic books. Every other barrier has been broken in comics: race, gender, class, physical challenges. But gay characters remain few and far between. Too few and far between to be killed off so regularly, without bringing attention to some rather ugly publishing trends. One ugly comic book incident in particular drove me to finish Hero. In the very popular superhero team The X-Men, the first and most prominent gay hero in the Marvel Comics universe, Northstar, was viciously killed by Wolverine—the star of the team, the star of the film. You see Wolverine's image on kids' lunch boxes; you see children dress up as him for Halloween. And he slaughtered the X-Men's token gay hero. I found this to be disturbing, to say the least. In all my years of reading X-Men, I have never known Wolverine to kill another hero. And yet, there he was, skewering Marvel Comic's most prominent gay hero through the heart with his adamantium claws. I thought this revealed a very ugly side of the people and publishers who make comic books, and not necessarily what the fans want. I'm a firm believer that you have a choice in how you react to such disturbing events. Now, my parents didn't raise me to ride on the back of the bus. They also taught me—and I'm a real big believer in this—that the pen is mightier than the sword. So I became more determined than ever to write Hero and have it connect with audiences everywhere. Its mission is vital; its message is more important than ever. For those of you who are interested in exploring this subject further, I have catalogued a list of the treatment of gay characters in comic books over the ages, and with few notable exceptions, it's not pretty. I will publish the list this summer, and I'll say this about it—it's very eye-opening. It shows you the need for a book like Hero. How did your background with movies inform your work on the novel? I could never have written Hero without my experience as an executive producer of the Narnia films. Putting the Narnia movies together has taught me so much about thinking visually and cinematically, especially about building a story, the architecture. I love a good structure. When I dove in to write Hero, I spent lots of time in the first portion of the book dealing with character on an interior level. But it was all with a plan that things were going to build and get bigger and bigger. As Thom confronts more and more internal challenges, the story grows in scale. My experience working in movies helped me construct the epic scope of Hero—from its humble beginnings to its earth-shattering climax. What starts out as a simple coming-of-age story builds to a whole new level. Having been a part of making those last battle scenes in The Lion, The Witch, and The Wardrobe, with legions of minotaurs, centaurs, dryads, goblins, gryphons, etc... well, it teaches you to think big. As an executive producer of Narnia, I learned everything I could possibly take in from my two story-telling mentors: C.S. Lewis, and Andrew Adamson, the director of the Narnia movies, and also the director of the first two Shreks. Andrew taught me how to think cinematically, head to toe. You would not believe how comprehensive his approach to creating the world of Narnia in real terms was. I could go on for hours about his vision for making Narnia a real place; he understands the process and the language of cinema so well. What he and Jack, known as C.S. Lewis to most of us, both understood so well, is the limitless power of imagination. It's what made telling Narnia in cinematic terms so challenging: there was such a tremendous responsibility to do justice to what a child's mind could conjure up when reading the book. When I wrote Hero, I wanted the story to come alive in just as vivid images in the reader's mind. This was probably the most important thing I learned from them. My next book is also inspired by what I learned from C.S. Lewis. He had an incredible talent for synthesizing various mythologies to create a whole new world. You may not know this, but Jack's good friend J.R.R. Tolkien, author of The Lord of the Rings, really slammed Jack in their writers' group, The Inklings, for incorporating so many different mythologies into his Narnia. Tolkien was a purist that way, but Jack followed his heart and incorporated elements from all the wonderful stories he read as a child. (I learned all this firsthand from C.S. Lewis's stepson Douglas Gesham, a producer of the Narnia films.) In Narnia, you'll find elements from so many different mythologies: Greek, Roman, Celtic, Egyptian, Biblical (e.g. Jadis, The White Witch herself, was originally a descendant of Lilith from Judaic lore, Adam's first wife, before Eve.) As a kid reading the Chronicles, I found all these mythological references fascinating. It made me go to the library and read as much as I could about each of those stories. I think Jack had tapped into some Deep Magic to open up minds of children everywhere, including mine. In my next book, I'm planning to take a page from C.S. Lewis's book, so to speak, in that I'm rewriting the entire mythology of werewolves but with some deeper meaning for those who choose to see it. Like Thom in Hero, like the Pevensie children in The Lion, The Witch, and The Wardrobe, the young protagonists in my new novel discover they have their own incredible destinies to fulfill, and their journey is full of challenges along the way. The first line I've written is "Forget everything you know about werewolves." Just like I turned the traditional superhero's journey on its ear with Hero, I plan to debunk everything you ever thought you knew about werewolves, and I'm weaving into the story so many components of various ancient lore—much of it Native American, Greek, Biblical, French, and Celtic, so far. We'll have to see what comes next. If I can write something a fraction as powerful as all that C.S. Lewis did, I would be thrilled. The Lion, The Witch, and The Wardrobe was my absolute favorite book as a kid. It is to this day what inspires me to write. What's your writing process like? Do you plot first or dive right into the writing? For Hero, the story burned a hole right out of me. I'd always wanted to tell this story about a young man who longs to find his place in the world, and who must learn to accept that he's empowered by the very differences that alienate him. But it wasn't until I had the idea to tell the story through the world of superheroes that I could finally get going. Once I'd decided on heroes as the subject, the Muses took over. I remember for about two months I wrote down every idea I had. They came to me like wildfire. Getting every idea onto the page was like trying to capture hundreds and hundreds of lightning bugs on a hot summer night. I don't think I slept very much during those two months. I was so inspired; the ideas kept waking me up in the middle of the night. We were prepping the first Narnia film at the time, and I was getting up at the crack of dawn to get in a few hours of writing before Narnia got going for the day. Then I spent some time arranging my thoughts. When I started writing the book itself and creating the world, the most incredible thing happened—the characters took over! I remember the first time a character took the reins of the story and told me what he wanted to do. It was within the earliest chapters. I wonder if you'll be able to pinpoint the exact moment. (Hint: It has to do with Thom's dad.) When that happened I knew I was honoring the story in the purest way possible; I knew I'd tapped into something very special and I was channeling it like crazy. I let the characters tell my fingers what to type. I did my best not to get in the way. In fact, the end of Hero I'd originally conceived is totally different from how the book actually ends. That's what happens when you bring characters to life—they take over! Despite the fantasy elements, this is a real look into the thoughts of a gay teen. How hard was it to go back to that place? Do your own experiences mirror Thom's in any way? Hero does take a real, sometimes brutal look into the thoughts of a teen who doesn't feel like he fits in the world, and many of Thom's experiences are based in part on things I went through when I was younger. I'm happy to share the specifics with anyone who wants to talk about it. Parts of the book were very difficult to write because of this. I'd love to hear which sections the reader believes to be based in reality. It was very important for Hero to be grounded in a real world. I learned that from Narnia—the best fantasy is always grounded in the deepest reality. There are direct experiences I had growing up that are in Hero. A lot of them with my father. I remember when I gave him the book to read, he called me up while he was in the middle and said, "I wasn't a monster, was I?" It was the saddest thing. "No," I said. I told him he needed to keep reading. You can ask me and I'll tell you exactly where these spots are in Hero. Most of the basketball sequences are modeled directly after experiences I had from being on the basketball team at school. One harrowing incident in particular. Can you guess which one? And I also tutored for years at a school close to my home in downtown New York, so that part came from reality too. I never had a Goran-type friendship, though. That part's fantasy. I did have a crush on a guy on my team who was a couple years older than I was. He had a wicked jump shot and great legs, and a smile that could light up a room. I don't think he ever had a clue I idolized him. I'm sure to this day he has no idea. Like Thom in Hero, I also had a coach who wouldn't play me. And it wasn't because I wasn't good enough, either. Later in life, I realized I'd been benched because I was different, and that scared him. I saw how much that hurt my father when he came to the games; he couldn't understand why I wasn't playing. I saw that coach when I went back to my school to give a talk about Narnia. He was still teaching and coaching at my school. It was interesting. But ultimately, one of the many themes in Hero—that your differences are what make you special—is something I only learned from looking back on growing up in a world where I didn't fit in. I didn't realize it at the time. I especially didn't realize at the time that we all feel that way to a certain degree. There would have been great comfort in knowing that I wasn't alone. I could have used a book like Hero when I was young. Hero gives you hope that no matter what your differences are, you are unique in this world, and you should shine as big and bright as you possibly can. I'm writing a sequel to Hero. There's so much more to tell: What Thom's mother was really up to. Where Goran really came from. What he had to do to escape his upbringing. The team itself will face a whole host of new challenges. Some new characters, too, villains and heroes alike. There are some huge surprises and twists waiting for you. I've mapped out a grand scheme for the entire series. How many books will be in the series, well, ultimately that's up to the characters. Like I said, they have a life of their own now. I'm also writing the first in the fantasy series about a young group of werewolves, a sister and two brothers. This is the book I talked about in which I've been particularly inspired by all I learned in Narnia. And of course, we're already working on making the third Narnia movie, The Voyage of the Dawn Treader. Being the rabid Narnia fan that I am, I'd be thrilled to see all seven of the books made into movies. But I also have to keep writing so that I can catch up with Georgie Henley (she plays Lucy in the Narnia films). She writes books too, and we share our work with each other as we go along. So far she's written three and half books, and I've only written two and a half. And she's only ten years old! I am determined to catch up!! She's been showing me her latest book, chapter by chapter, on the set of Prince Caspian. While we were doing press for The Lion, The Witch, and The Wardrobe, she shared her third book with me while she was writing it. I'd read half of the book, and it was this really heartbreaking story about two sisters, separated at a young age, who finally found each other in the world. Then she told me, after they'd found each other and formed a very successful rock band, that she was killing off the long-lost sister. Georgie! I couldn't believe it. I begged her not to do it—I was so happy for those girls. And guess what, when I got to the last chapter, she didn't do it! She let her live! Now I'm reading her fourth one, and she's been teasing me on set that I won't stand in the way of her killing off one of her main characters this time. I just can't figure out who it's going to be. The girl's got talent! Oh yeah, and lots of surfing. I hope I get to catch as many waves as possible this summer. How did you go about getting the cover of the book? You know that old adage, you can't judge a book by its cover. I hope that isn't true. Please . . . judge my book by its cover . . . please! For the cover of Hero, I wanted something as special as the pages inside, so I approached the most renowned jacket designer in the history of book covers—Chip Kidd. I'd been warned that he was very selective about his projects, just look at his body of work. He's a true artist and a genius of the craft, and his talents are in great demand. So I'd been warned not to get my hopes up. I called him up, and we talked about the idea of Hero and he agreed to meet me for lunch. There we talked about the book, and I honestly felt like I'd been separated from birth from Chip. We both grew up with the same comic books, we're both fascinated with the genre, and we know its many subtexts well. Truly, he was an inspiration to me. So for the first time in his career, Chip Kidd designed the jacket for a young adult cover. And it is for Hero. I couldn't be more proud. In addition to being a surfer and comic book collector, I'm also an avid tennis player. You always want to play tennis with someone better than you. And in Chip Kidd's case, I was playing tennis with John McEnroe, Roger Federer, and Venus and Serena Williams across the net all at once. 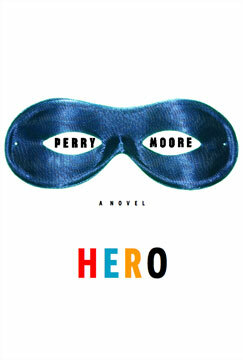 Thank you, Chip, for stepping into the world of young adult literature with your first cover, Hero! What made you choose to tell your story in the world of superheroes? What makes you so fascinated with comic books? Same reason most kids pick them up. Lots of really cool-looking people doing amazing things. But on a deeper level, here's a great example of why I believe in the power of superheroes to open up the imaginations of young minds, and it's why I chose this landscape to tell Hero. My friend Rebecca Romijn (whom I just co-directed in our latest movie, Lake City) articulated for me that the X-Men movie franchise is an allegory that tracks the history of the Civil Rights movement. She's very passionate about that part of it, a true Berkeley girl at heart. Passionate enough to endure eighteen hours plus of makeup to play Mystique. She told me about how rigorous the whole process was to get made-up to play Mystique, before she even could start shooting a single scene—that's some devotion! Fortunately, when Stan Lee produces our movie version of Hero, I don't think I wrote any parts for actors who will have to go through that much makeup. Not as much as the cavalry of creatures in Narnia, either. At least I don't think so. Incidentally, we lived with Rebecca while we shot our movie—much to the envy of all the guys in our crew—and constantly played practical jokes on each other. She's a great practical jokester. You never knew what was going to happen to you in that apartment. If those walls could talk! "The first time I saw HERO in a book store. 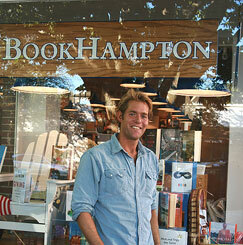 We were enjoying the end of the summer in Montauk, and I learned from my friend Chris’ parents Vivian and Bernard that HERO was in the front window at Book Hampton on Route 17 in East Hampton. On our way home that weekend, we had to get a shot. How happy am I?"